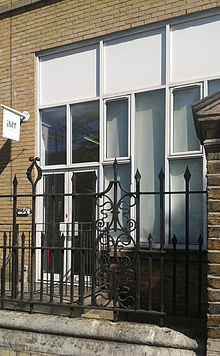 IMT Gallery is a contemporary art gallery based in London. The gallery has become known for its innovative site-specific installations, its championing of sound art and of artists working across media. Alongside work by emerging artists the gallery has exhibited work by established figures such as William S. Burroughs, Brion Gysin, Ray Johnson and Józef Robakowski. The gallery has commissioned and exhibited works with support from the Arts Council England, the Henry Moore Foundation, The Danish Arts Foundation, Institut Français, OCA: Office for Contemporary Art Norway, the Polish Cultural Institute among others. The gallery represents David Burrows, Lotte Rose Kjær Skau, Laura Pawela, Plastique Fantastique, Gordon Shrigley, NaoKo TakaHashi and Mark Peter Wright.